I love this video and this song with Tegan and Sara. We shot it in Houston on a brief moment where all of us were free. Louis Van Amstel makes a fun little cameo too as we were right in the midst of “Dancing with the Stars” madness. Liam Sullivan directed this gem of a film and I absolutely love it. It makes me cry. Enjoy!! Margaret Cho – Intervention – featuring Tegan and Sara from Margaret Cho on Vimeo. Read Margaret’s blog about making the song. “Intervention” is on iTunes here or buy the CD or Vinyl directly from Margaret and get an automatic download of the whole album! Cho Dependent is Grammy Nominated! Atlanta Food Drive – Bring 10 items, meet Margaret after the show! 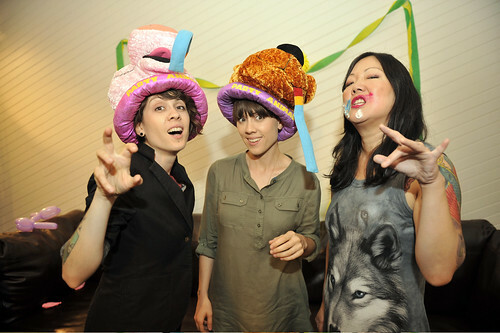 Margaret Cho AND Tegan&Sara in one video……my life is complete. Very funny, very cute, loved it, Margaret! Love it! Thanks so much for making it and sharing it with us. Awesome! As always… super hilarious. Great song. Also… I love gummi worms. I love you Margaret Cho!!!! You are the best!!!! Tegan and Sara looking cuter than cute. Loved the video, and the song is super catchy! I wish two hot singing twins lead my intervention. You’re the luckiest alcoholic ever. You + Tegan & Sara = EFFING AMAZING! Don’t even get me started on You + Ani Difranco. Keep being amazingly fabulous! wow. it gives the word intervention a whole new meaning. well done Cho!